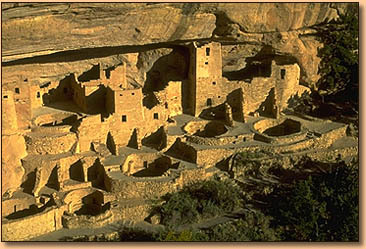 Mesa Verde is a United States National Park located in the Southwestern corner of the state of Colorado. Native Americans built a great concentration of ancestral Pueblo Indian dwellings from the 6th to the 12th century at an altitude of more than 2,600 m. Some 4,400 sites have been recorded, including villages built on the Mesa top. The culture represented at Mesa Verde reflects more than 700 years of history. Today most people call these sheltered villages "cliff dwellings". The cliff dwellings represent the last 75 to 100 years of occupation at Mesa Verde.